This is the second album I've had the opportunity to review by Abolitionist. I have to say that I was pretty excited when this came in the mail the other day. This is a band that I'm pretty confident I may not have ever heard of if I didn't do this website. 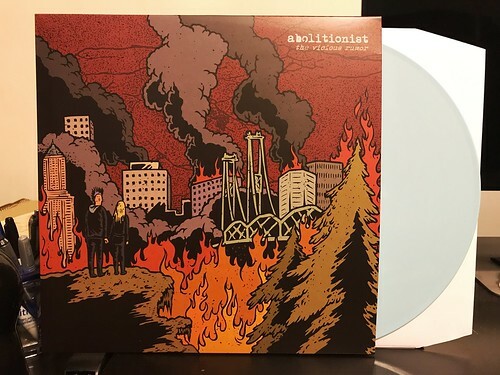 The last Abolitionist LP was actually the very first full length vinyl record that anyone had ever sent me to review. Fast forward a few years later and this new one is certainly among the review records I'm most excited about listening to. This and Zapiain are probably my favorites of the most recent batch I've been going through. Abolitionist harvest the most raw and angry grains of pop punk. Every song has a subtle catchiness to it, but the hooks are often somewhat obscured by the sheer energy that the band is able to project. Much like Dillinger Four or Off With Their Heads, Abolitionist can take gravely vocals about depressing topics and still wrangle a song that has me nodding my head along. As usual, I tend to favor the songs that lean the most heavily towards straightforward pop, but even the more incendiary burners on this album are pretty damn good. Every so often it's nice to have an angry album you can just be pissed off with. Might I recommend Abolitionist for your next time.